Thank you for the postcard. It’s not too cold today – the snow has melted and the temperature is around 2 degrees Celsius – much warmer than it was last week! You are lucky that it is boiling, we need to wait another 3 or 4 months for it to get up to around 18 – 22 degrees. I n that would probably still be cold for you as I have relatives who live in Perth, WA ae d when they were here, we had a heatwave but they still wore jackets. 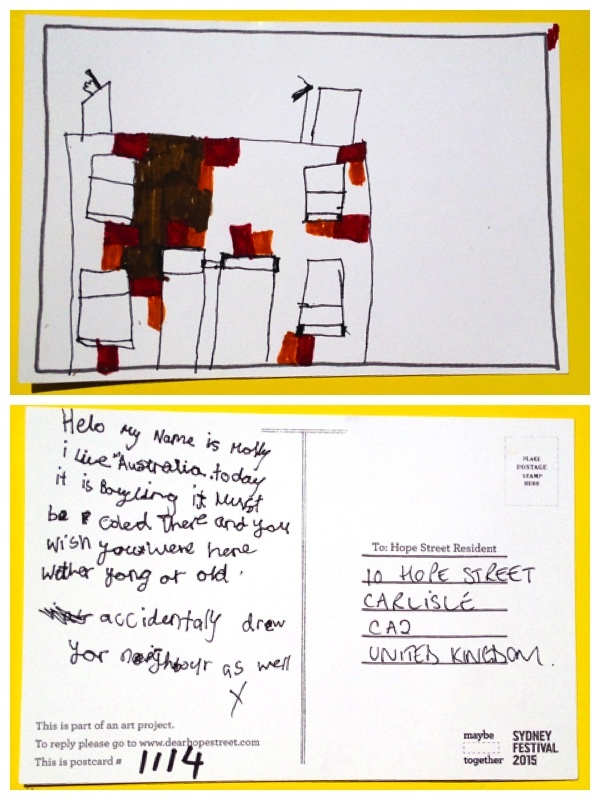 Thanks again for the postcard and good luck with your art project. Thank you for your lovely reply, I was so excited to read it! I know how cold it gets there as my aunties and grandma live in England and I visited 2 years ago at Xmas time…I hope summer comes soon for you!